Now that we have know something about deferreds, we can rewrite our Twisted poetry client to use them. You can find client 4.0 in twisted-client-4/get-poetry.py. Our get_poetry function no longer needs callback or errback arguments. Instead, it returns a new deferred to which the user may attach callbacks and errbacks as needed. Notice the way we release our reference to the deferred after it is fired. This is a pattern found in several places in the Twisted source code and helps to ensure we do not fire the same deferred twice. It makes life a little easier for the Python garbage collector, too. Notice how we take advantage of the chaining capabilities of the deferred to refactor the poem_done invocation out of our primary callback and errback. Because deferreds are used so much in Twisted code, it’s common practice to use the single-letter local variable d to hold the deferred you are currently working on. For longer term storage, like object attributes, the name “deferred” is often used. A Deferred object represents an “asynchronous result” or a “result that has not yet come”. I’m an asynchronous function. Whatever you want me to do might not be done yet. But when it is done, I’ll fire the callback chain of this deferred with the result. On the other hand, if something goes wrong, I’ll fire the errback chain of this deferred instead. Of course, that function itself won’t literally fire the deferred, it has already returned. Rather, the function has set in motion a chain of events that will eventually result in the deferred being fired. So deferreds are a way of “time-shifting” the results of functions to accommodate the needs of the asynchronous model. And a deferred returned by a function is a notice that the function is asynchronous, the embodiment of the future result, and a promise that the result will be delivered. It is possible for a synchronous function to return a deferred, so technically a deferred return value means the function is potentially asynchronous. We’ll see examples of synchronous functions returning deferreds in future Parts. Because the behavior of deferreds is well-defined and well-known (to folks with some experience programming with Twisted), by returning deferreds from your own APIs you are making it easier for other Twisted programmers to understand and use your code. Without deferreds, each Twisted program, or even each internal Twisted component, might have its own unique method for managing callbacks that you would have to learn in order to use it. When first learning Twisted, it is a common mistake to attribute more functionality to deferreds than they actually have. Specifically, it is often assumed that adding a function to a deferred’s chain automatically makes that function asynchronous. This might lead you to think you could use, say, os.system with Twisted by adding it to a deferred with addCallback. I think this mistake is caused by trying to learn Twisted without first learning the asynchronous model. Since typical Twisted code uses lots of deferreds and only occasionally refers to the reactor, it can appear that deferreds are doing all the work. If you have read this introduction from the beginning, it should be clear this is far from the case. Although Twisted is composed of many parts that work together, the primary responsibility for implementing the asynchronous model falls to the reactor. Deferreds are a useful abstraction, but we wrote several versions of our Twisted client without using them in any way. Again, this is similar to our previous Twisted clients, though the visual representation is starting to become vaguely disturbing. We probably won’t be showing any more of these, for the sake of the children. 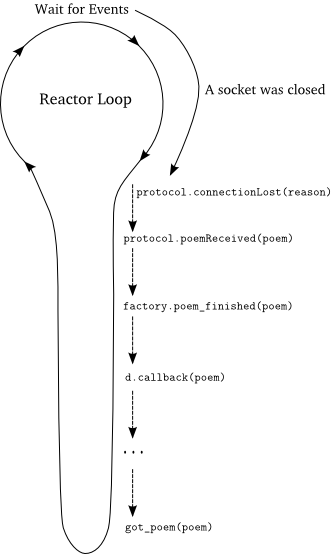 One wrinkle not reflected in the figure: the callback chain above doesn’t return control to the reactor until the second callback in the deferred (poem_done) is invoked, which happens right after the first callback (got_poem) returns. There’s one more difference with our new stack trace. The line separating “Twisted code” from “our code” is a little fuzzier, since the methods on deferreds are really Twisted code. This interleaving of Twisted and user code in a callback chain is common in larger Twisted programs which make extensive use of other Twisted abstractions. Only one callback runs at a time. When the reactor is running our callbacks are not. If our callback blocks then the whole program blocks. Deferreds are a solution (a particular one invented by the Twisted developers) to the problem of managing callbacks. They are neither a way of avoiding callbacks nor a way to turn blocking callbacks into non-blocking callbacks. We can confirm the last point by constructing a deferred with a blocking callback. Consider the example code in twisted-deferred/defer-block.py. The second callback blocks using the time.sleep function. If you run that script and examine the order of the print statements, it will be clear that a blocking callback also blocks inside a deferred. By returning a Deferred, a function tells the user “I’m asynchronous” and provides a mechanism (add your callbacks and errbacks here!) to obtain the asynchronous result when it arrives. Deferreds are used extensively throughout the Twisted codebase and as you explore Twisted’s APIs you are bound to keep encountering them. So it will pay to become familiar with deferreds and comfortable in their use. Client 4.0 is the first version of our Twisted poetry client that’s truly written in the “Twisted style”, using a deferred as the return value of an asynchronous function call. There are a few more Twisted APIs we could use to make it a little cleaner, but I think it represents a pretty good example of how simple Twisted programs are written, at least on the client side. Eventually we’ll re-write our poetry server using Twisted, too. But we’re not quite finished with deferreds. For a relatively short piece of code, the Deferred class provides a surprising number of features. We’ll talk about some more of those features, and their motivation, in Part 9. Update client 4.0 to timeout if the poem isn’t received after a given period of time. Fire the deferred’s errback with a custom exception in that case. Don’t forget to close the connection when you do. Update client 4.0 to print out the appropriate server address when a poem download fails, so the user can tell which server is the culprit. Don’t forget you can add extra positional- and keyword-arguments when you attach callbacks and errbacks. Thank you for very useful tutorial! Good done! keep on! Thank you for your article, I read it word by word. I am waiting Part 9 now. Maybe my puzzle will solve by it—-How to organize a defferred with your work. You’re welcome! Part 9 is taking me a while, but I hope to have it out in December. I am waiting Part 9 now. Maybe my puzzle will solve by it—-How to organize a defferred with your work implictly. Does it mean, if one define, say twenty callbacks to one deferred, would reactor do short pause before processing each callback in the chain, to look if there are any other jobs to do? It depends, but given what we’ve covered up to part 8, it’s actually the other way around. All twenty callbacks will run before the reactor gets control again. You’ll see in a later part you can return control to the reactor before the entire chain is finished. But it’s the deferred’s decision to make, not the reactor’s. The reactor doesn’t really know anything about deferreds, it’s just invoking callbacks and a deferred is just a fancy callback. I don’t understand why you check, if the attribute self.deferred is a None-type, for example in “poem_finished” (see if-clause). How can it happen that the attribute becomes a None-type? And you said, that the release of the reference is good for the Python garbage collector…and why? Another question: You explained, why you make a thing like “d, self.deferred = self.deferred, None” to ensure that this Deferred won’t be fired twice. But I can’t imagine such a situation. I mean, after this statement, you fire the callback by calling “d.callback(…)”. Thus, after this we “leave” the factory and “switch” to the main-function, where the fired callback is (I know, it sounds a bit non-Twisted, but I hope, you understand what I mean^^). So, another firing of this deferred can’t happen. how it can become None. the factory’s method’s to fire. So it’s just pretty standard Twisted practice to use this pattern. I’ve been working through your articles over the past few days and they are excellent and have provided the first real explanation of how asynchronous programming works that I’ve read. So far the suggested exercises have been very good at enforcing what I’ve learned, however I was wondering if you could create more exercises, but also offer and example on how you think the problems should be solved as I’m unsure if the my implementations are the best or even correct the method of tackling the problems. Hey Thomas, glad you like the introduction. I plan on working up solutions for at least some of the exercises eventually. There is one thing that I didn’t see immediately in this part (although it was a mental facepalm once I figured it out). Why can’t the deferred fire after it is returned, but before callbacks are added to it? I think that that would make a nice exercise, to “test” whether people really got what asynchronous means at this point. It seems trivial, but I don’t think it is for most people when they hear about asynchronous programming for the first time. Also, I’d guess that understanding the answer is a great way to understand the entire concept. Thanks very much! That’s a good point you bring up. I will add an exercise for that thought experiment. There is one wrinkle you will discover as you read further, which is that a deferred may be fired before it is returned. Because of that, I’m going to add the exercise in a later Part. I had my answer for exercise 1, but i dont quite like it. Dave, can you share your answer? Sure, I’ll try to get it posted this weekend. Ok, I checked a solution to #1 into my git repository. PoetryClientFactory doesn’t seem to behave like a factory. (It’s treated as a single-use object, contrary to the purpose of factories.) The Twisted docs indicate this is indeed how ClientFactory is used. Looking around a little more produced http://comments.gmane.org/gmane.comp.python.twisted/22806 where they end up discussing this. What I got from it was that ClientFactory had a use once but isn’t necessary anymore. after I wrote this, is a new alternative. This is wonderful! Thank you so much for the great tutorial! You are quite welcome, glad you are enjoying it. In the solution to this part, in the method startedConnecting for the PoetryClientFactory, the timeout callback is given as self.timeout, but later in the class there is no timeout method – there is a cancel_timeout method though. Should the first arg to callLater be cancel_timeout? It’s interesting to note that the ClientFactory winds up keeping track of two deferreds – one for the normal poetry processing (for lack of a better term) and one for the timeout. Continuing the observation, the normal poetry processing deferred is passed up into the application code, and the timeout one isn’t – it’s handled strictly by the factory. Actually an argument is passed in to the factory to make it configurable, but that’s it as far as interaction with the app code goes. Hi Brenda, in the solution, the first argument to callLater is actually the number of seconds to delay the call. The second argument (self.on_timeout) is the actual callback. Your observation on the ClientFactory is correct. It would be possible to have a single callLater callback apply to all the downloads, with a bit of code refactoring. When doing the second exercise I just realized that I don’t quite know what the “interface” for a callback in the deferred context is. It seems I have to take err as the first argument and return that as well, correct? Not sure if this is appropriate. error, you return it from the errback. Your solution looks perfect to me! This tutorial is so great! Thank you Mr. Dave very much. I was looking at your solution to problem #1, and noticed that you handle the timeout as part of the PoetryClientFactory, rather than in the PoetryProtocol. In this small example your technique works well, because the factory has access to the deferred and the connector. However, I think this approach means the timeout held by the factory is shared by all the protocol objects built; meaning that you need a separate factory object for each protocol object built. Am I wrong in this line of thought? Is it desireable to push the timeout logic into the protocol? and What’s the easiest way to do so? That is correct, though it’s really the fact that the Factory has a single Deferred object which makes it a ‘one-shot’ object. The ‘connector’ instance is per-connection and that is passed to the timeout callback as an argument, so each different connection would in effect have a different timeout callback. Client factories are generally one-shot as you just need to make one connection anyway. But let’s suppose you did want to make multiple connections with the factory. In the case of a server, there’s not going to be a Deferred instance on the factory anyway, so I think my solution would handle multiple connections just fine (each new connection would result in a new call to startedConnecting with a new connector instance). You could move the timeout into the protocol instance, where you would probably start the timer in the connectionMade callback and call self.transport.loseConnection when the timeout expires. However, there is a wrinkle. The Protocol isn’t created until after the connection is made, and do you want the timeout to apply to the entire attempt, connection included, or only after the connection is made? The way I have written it, it applies to the whole process. By the way, there is a default timeout of 30 seconds for TCP connection attempts in Twisted, so technically I should really pass my configured timeout value to connectTCP as well. If you wanted to handle your own timeout in the Protocol but still have it apply to the entire process, you would need to set the timeout on connectTCP and then subtract the time it took to make a connection when you set the timer in the Protocol. Your series continues to be a great help. Thanks again! As it turns out, it’s pretty much what you describe in your response to Eric above. I was, in fact, conceiving of the timeout as applying to just the time spent receiving data, not to the whole connection attempt. So while I didn’t account for the wrinkle you mention (and I see why that might be a more usual conception), at least I did implement what I was trying to. The solution I ended up with here is actually identical to the one I had for the timeout exercise in part 6 except that the call to self.factory.errback has become self.factory.deferred.errback. I tried to find ways to make more active use of the deferred, but I kept running up against the problem that connectionLost would always be called, and would always need some way of knowing the reason the connection closed. I’ve looked through the solution you’ve provided, and (once I proved to myself that connector.closeConnection does not stop connectionLost from being fired) finally figured out was going on. I actually tried to implement something similar at one point, though I never thought it through to the point where it would have worked – probably because my instincts tell against it. I balk at the idea of setting up something that will result in a chain of function calls that necessarily do nothing. It’s sort of like Lucy and the football, only with attribute references. Also, since I was thinking of the timeout as applying to the time spent receiving data, the protocol seemed a more natural location for the timeout mechanism than the factory. What I really wanted was a way to send a message to loseConnection that would end up in the reason sent to connectionLost. Is there a reason such a feature would be undesirable? I guess the main question I have about your solution is this: is a pattern of leaving chains of function calls in place while pulling the rug out from under them a common pattern in asynchronous programming? Looks good, but I guess I don’t understand what you mean by “a chain of calls that necessarily do nothing”. executed each time, but that doesn’t mean the other clauses serve no purpose at other times. I’m sorry if I was unclear. I especially did not mean to imply that any of the existing functions were pointless. What I was thinking was this. If the connection times out, on_timeout dereferences the factory’s timeout_call and deferred attributes. However, the entire chain of function calls connectionLost -> poemReceived -> poem_finished -> cancel_timeout is still in place, even though those attribute references have been yanked away and it now does nothing. You can’t know whether the timeout will fire or not, but once it does, you can know that this chain of calls no longer does anything — indeed, they should do nothing (or at least, do nothing with the received data), since this implementation just drops unfinished downloads. My instinct is to stop the chain from firing. I tried to find a way to stop connectionLost from calling poemReceived without setting an explicit flag attribute, but I could not. This is why I wanted to be able to attach an error message to loseConnection, and I am still puzzled as to why it is not possible to send a status flag through loseConnection to connectionLost. The obvious virtue of your implementation is that the protocol class stays very simple and it does not need to be involved in any of the logic of the timeout process. However, this raises the question of how to think about what belongs in the protocol, in the factory, etc., which are the questions I started this series trying to get a grasp of. Perhaps another way to put all this might be that I’m trying to figure out to what degree the difference between your approach and mine is a neutral matter of aesthetics, and to what degree it follows from principles that you are aware of and I am not. Oh, no offense taken, I assure you 🙂 I think I see what you are getting at now. Basically this all comes from the fact that I chose to have the end of the poem represented by the close of the connection. Not really great practice, frankly, since there are so many reasons why that might happen. But it does make things simpler to start with. If there were an explicit way to mark the end of a poem then I think this issue would not even arise. I’m not claiming my answer is definitive by the way. Why are doing ” if self.deferred is not None : ” in both poem_finished() and clientConnectionFailed() methods ? in the Twisted source code. Dave, thanks for your efforts. Would not have began connecting the dots without your insight. So I tried implementing my own script based off your model but I want my connection to stay (or attempt to stay) connected forever. However, I don’t understand why you set self.deferred =None. After I receive my first data I get the message passed via the deferred but then it gets set to None so subsequent times through the if will always evaluate False and I don’t get a passed message. I don’t understand what the intent is here. Please enlighten. Looking good! Since the deferred attribute is set to None when it is fired normally, I think it would be better to test for that rather than checking deferred.called. Thanks for this very well written tutorial. Best I had seen on Twisted & Deferreds. You have a talent for writing explanatory material. You should write a book on Twisted, and anything else you teach. Your style is very very good, and gets to the bottom of “why”. The only twisted book I have read is nowhere close to what you have written. I would buy it yesterday if you had written a book. Extremely lucid, and deep at the same time. Hi Dave, enjoying the tutorial and attempting the exercises. I find that I am not completely comfortable about what functionality should(?) go in the PoetryProtocol and what in the PoetryClientFactory. For example in my solution to client 4.0 exercises 1 plus 2, I left the factory unchanged from your client 4.0 code, and made changes only to the protocol, and to poetry_main(). It is here, Solution to client 4.0 exercise 1 plus 2 in https://pastebin.com/XWCNzRm5. It seems to perform correctly. In general what are the benefits of and requirements for a factory class in twisted applications? The main question is what state needs to be shared across individual client connections, if any. Cross-connection state is a good candidate for state on the factory. For example, keeping track of how many current client connections you are handling.